Craig Mammalton – From SpongePedia, the biggest SpongeBob-wiki in the world! 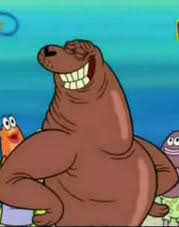 Craig Mammalton is a seal that is very tan and and is only seen in Sun Bleached. He is known for his annual summer shindig. The shindig is fit for only tan people. SpongeBob followed Craig's advice, and he was able to get into the party with his Sun Bleach tan. Craig is also the tannest man on TV. He also has his own book. Everybody loves him because he is very tan and good-looking. He has a bunch of wrinkles. Craig is shown to be very snobbish, seeing as how he made fun of SpongeBob and Patrick. Craig also gets all of the ladies attention. He likes to hang out at Goo Lagoon. According to legend, his tan is so deep that his bones have a tan that makes them look like a golden caramel color. In the German version they call Craig "Rocky Robbenroll". He is voiced by Dee Bradley Baker. This page was last modified on 13 July 2011, at 15:49. This page has been accessed 18,178 times.